After being nearly invisible for weeks, the local chickadees here in Massachusetts are suddenly everywhere. This is their typical pattern, and it’s common to many species. Nesting pairs become very quiet and secretive while they have eggs and young in the nest, but once the young fledge the whole family travels around their territory together. The adults gather food and deliver it to the young who are staying close behind. It helps the parents to shorten the trip to deliver food to the young, and it gives the young birds a chance to learn by watching, as they see how and where their parents find food. Not that they seem to pay much attention, as kids do. They spend most of their time messing around, hanging from leaves and twigs, and begging for food from the parents. As soon as they see that an adult has found something to eat the begging becomes more intense, and they sit up with fluttering wings and sustained begging calls. All of this makes the family very conspicuous in the woods. The calls of the young birds are nearly constant, the group is easy to find, and watching them offers some good entertainment. 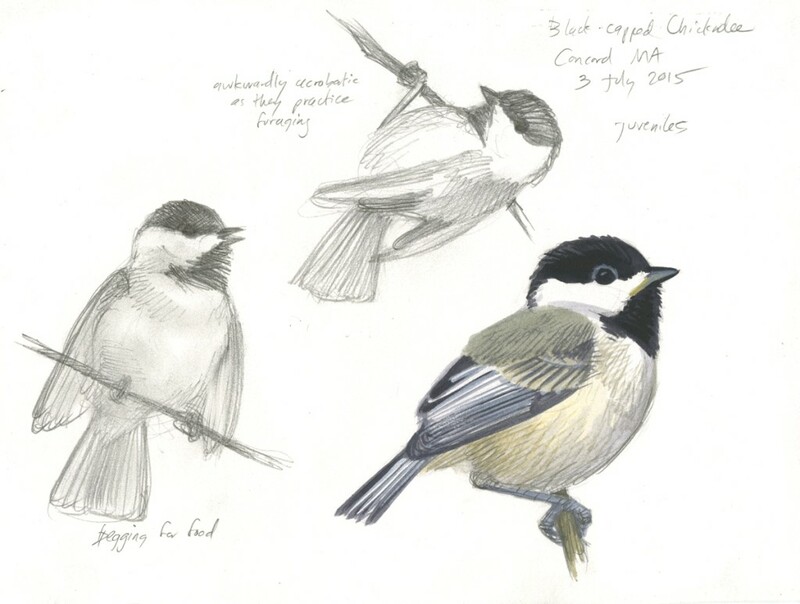 A pencil and gouache sketch of some Black-capped Chickadees in Concord, MA. This and other recent artwork is currently (through July 8) available at auction, click the image to go to the auction page. Thankfully there s an herbal formulation proven loratadine sale online by 79 published..